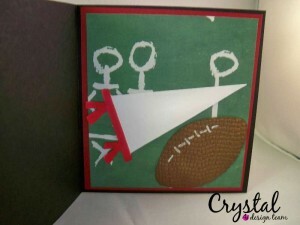 Today for the Sports challenge I am using Sports Fan SKU # K1204 , this guy is ready to do it all , he may be the biggest fan of all , so to support him I created a background with a football plan /play paper and then got my cricut cutting the football and the baseball and the pennant ,I colored him with prisma colored pencils and gamsol( still in training ) , the football I embossed using an embossing cuttlebug folder called Mesh , I thought it made it look more like a real football , I inked all my layers and edges with SU soft suede.He is ready the get his Game On !!! 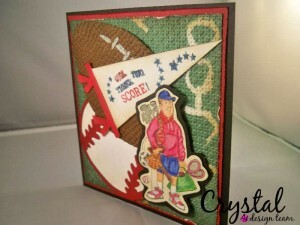 Thanks for stopping by and be sure to visit the Ai blog tomorrow to see what Tammie has made for you!!! Make your day 8UpScrapin !!! 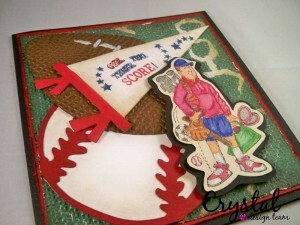 “Lets Play Ball!” You hit this one out of the ballpartk. 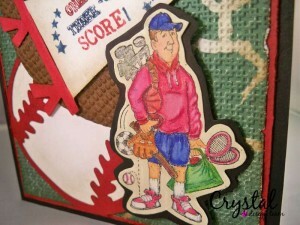 Love how you incorporated all the “minor and major” (hehe) details. 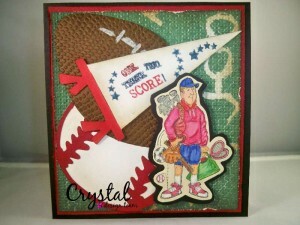 Boy, your creative mojo was flowing, great card for any sports guy.